Editor’s Note: WOW Air shut down in March 2019. Ever wonder what it’s like to fly on a transatlantic airline that charges as little as $99 from the U.S. to Europe? Wonder no more! Here are the pros and cons of flying with Wow Air. Introductory fares from Boston and Baltimore to various European capitals sold at $99 each way, including all taxes and fees, during several sale windows in 2015. And though you won’t always find fares that low, you can still routinely save hundreds of dollars by flying Wow Air. Carry-on bags: You can bring one carry-on bag weighing 11 lbs. or less per passenger for free. You can increase the weight limit to 26 pounds for an additional $38 (prepaid online) or $48 at check in. Checked bags: Checked bags are expensive on Wow Air: $48 when prepaid online, $67 at check-in, and double that for the second bag. A third bag costs $144 when prepaid online or $201 during check-in. Each bag may weigh as much as 44 lbs., and overage charges are $18 per kilo per bag, up to 12 kilograms (26 lbs.). Note that the checked bag fees are per flight segment, meaning you’ll need to double the prices if your flight includes a single layover. Tip: I recently flew Wow Air to Europe. The carry-on bag weight limit was strictly enforced (down to the ounce) in the U.S., but entirely disregarded in Europe. Your experience may vary, but keep that in mind when packing your carry on. No snacks are distributed on the plane (not even a snack-sized bag of pretzels). Requests for a cup of water will be met with a pitch for a bottle of water at a cost of 300 ISK ($2.33 USD at time of publication). A cup of coffee or tea goes for 350 ISK ($2.71) and a miniature-sized bottle of a mid-grade alcoholic spirit sells at 900 ISK ($6.98). At the moment, Wow Air only serves Boston, Baltimore, Montreal, and Toronto on this side of the Atlantic. 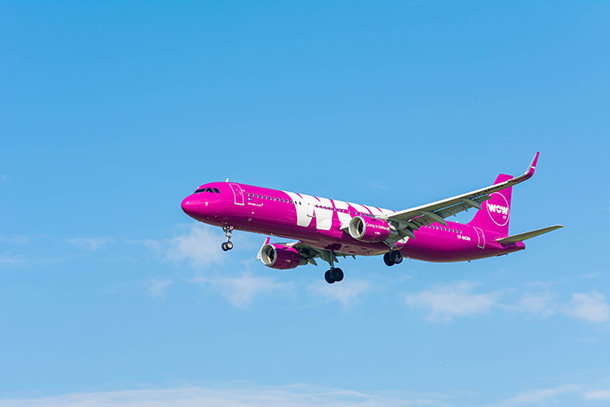 Across the Pond, Wow Air has a broader foothold, serving Alicante, Amsterdam, Barcelona, Berlin, Bristol, Copenhagen, Dublin, Dusseldorf, London, Gran Canaria, Lyon, Milan, Nice, Paris, Rome, Salzburg, Stockholm, Tenerife, Vilnius, and Warsaw; plus a hub at Reykjavik. Updated 01/19/2016: Wow Air has just announced expansion into the Los Angeles and San Francisco markets, and will begin flying to Europe come June 2016. Tickets are on sale now. RELATED: Are Dirt-Cheap Flights the Way of the Future? Wow Air’s fleet is much newer than many rival carriers. The planes are outfitted with basic amenities such as reclining seats, food trays, and overhead lights; and bathrooms and overhead bins are comparably proportioned to most other carriers. Superseding similar budget lines, seats are still spiffy clean and come equipped with a built-in device charger. All Wow Air transatlantic flights briefly stop in Iceland. This is great if your final destination is Iceland, especially because Wow Air’s Reykjavik flights are the most cost effective; not so much for those with a final destination to one of the airline’s other 20 European cities. One of Wow Air’s main competitors, Icelandair, allows optional single- or multi-day stopovers in Iceland at no additional charge. This is a moot point for those uninterested in the Blue Lagoon, the Northern Lights, and the bountiful natural beauty Iceland offers, but a missed opportunity for those desiring a quick or multi-day Reykjavik visit without incurring extra airfare costs. Seat selection—for any seat, regardless of location, e.g., deeper-pitch seats like those on the exit row—costs $6 to $67 dependent on route and seat pitch. Tip: If you don’t want to pay this premium but have seat preferences (e.g., window seat, sitting with travel companions), check-in as early as possible to get first dibs of the remaining open seats. Boarding groups are assigned by check-in time. Despite its value model, Wow Air doesn’t skimp on seat width and pitch. Comparable to other airlines, Wow Air’s A321 (the Airbus used for its transatlantic flights) seat pitch measures as much as the average American Airlines Boeing 757 at 31 inches, though it falls a smidge short in width. Flight attendants walk the aisle pitching duty-free wares, including perfumes, alcohol, cigarettes, and souvenirs; and seat tops are draped with paid advertisements of Reykjavik airport transfers and day excursions. Depending on your sensibilities, these features are either a tacky turn off or a convenient time-saving resource to pick up a last-minute item, duty free. Patricia Magaña will gladly fly Wow Air again. Follow her on Instagram @PatiTravels for travel inspiration.